Belief in God is the first step. By the belief in God is attained the losing oneself in God. If one is able to do it, one has attained a power which is beyond human comprehension. The process of attaining this is called Fana by the Sufis. Fana is not necessarily a destruction in God (metaphysically thats another way to explain why Quran says, Jesus didn't die on the cross but it appeared so to the unenlightened mind from outside). Fana results in what may be called a resurrection in God, which is symbolized by the picture of Christ. 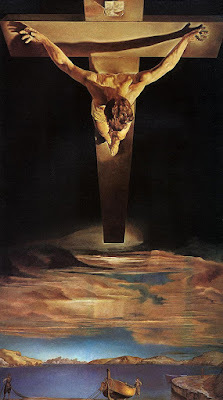 The Christ on the cross is narrative of Fana; it means, 'I am not.' And the idea of resurrection explains the next stage, which is Baqa, and which means, 'Thou Art', and this means rising towards All-might. The divine spirit is to be recognized in that rising towards All-might. Fana is attained ... by denying one's little self, the false self which covers one's real self, in which the essence of divine Being is to be found. What is this journey taken by the soul from the source to manifestation, and from manifestation back to the same source which is the goal? Is it a journey, or is it not a journey? It is not a journey in truth. It is a change of experience which makes it a journey, a story; and yet a whole journey produced in moving pictures is in one film which does not journey for miles and miles, as it appears to do on the screen. Do many journey or one? Many while still in illusion; and one when the spirit has disillusioned itself. Who journeys, is it man or God? Both and yet one: the two ends of one line. What is the nature and character of this manifestation? It is an interesting dream. What is this illusion caused by? By cover upon cover; the soul is covered by a thousand veils. Do these covers gave happiness to the soul? Not happiness, but intoxication. The farther the soul is removed from its source, the greater the intoxication. Does this intoxication help the purpose of the soul's journey towards its accomplishment? It does in a way, but the purpose of the soul is accomplished by its longing. And what does it long for? Sobriety. And how is that sobriety attained? By throwing away the veils which have covered the soul, and thus divided it from its real source and goal. What uncovers the soul from these veils of illusion? The change which is called death. This change can be forced upon the soul against its desire, and is then called death. This is a most disagreeable experience like snatching away the bottle of wine from a drunken man, which is most painful to him for a time. Or the change can be brought about at will, and the soul throws away the cover that surrounds it and attains the same experience of sobriety while on earth, even if it be but a glimpse of it. This is the same experience which the soul arrives at after millions and millions of years, drunk with illusion; and yet not exactly the same. + remembering the holy good friday. may profound Divine peace and blessings be upon Jesus Christ and Mother Mary. if you know, may you read the opening chapter of Quran, sura Fatiha and send the blessings upon both the spirit of Christ and Mary.